"A review of the operation of the Police Act and fundamental improvements in the management of the Metropolitan Police Authority. A root and branch improvement in the management of London Underground and a radical reassessment of the framework of legislation relating to strikes in essential services." Community policing: Action to ensure successful police officers have real career and promotion opportunities by remaining in one place for a much longer period of time. Industrial relations: A review of the framework of law governing employee relations and strikes in essential public services. Congestion charge: Will end the congestion charge if contractually possible: "I reject road pricing, because of its consequences for low-income families and the scope that it offers for back door taxation dressed up as a green measure." Buses: We need conductors on buses. We need better-trained drivers who drive more safely and with consideration for their passengers. And there needs to be proper ventilation on buses. Cycling: A clampdown on pavement cyclists and coordination of cycleways across London's boroughs. Transport for London: Face-to-face meetings between passengers and TfL executives through the creation of a forum for customers. Infrastructure: Campaign for more rail infrastructure and modernisation of the Thames flood barrier. Planning reform: Work with central government to empower local communities to defend diverse shopping centres. Tall buildings: There must be no return to planning policies that favour commercial skyscrapers or high-rise social housing. Housing for Londoners: New housing has to be built with an eye for attractive streets, garden squares, local grassed play areas that are safe and plenty of trees. New housing should incorporate proper waste storage and separation facilities. The current's Mayor's centralised housing strategy will be replaced with support for more homes in mixed communities. A greener London: More trees - including “Olympic Avenues” to rival the green corridors of roads like the Thames Embankment - will be planted to make London cleaner, greener and cooler. On the basis of the precautionary principle, London must play its full part in combating climate change by cutting unnecessary transport emissions, improving domestic energy efficiency and supporting carbon trading. Wider use of photovoltaics and improved insulation in homes will be encouraged. A Mayor's Award Scheme will be launched to recognise companies that work with local communities to tackle graffiti. A new budget for London: All spending - not just increments - to be reviewed via the drawing up of a zero-based budget. A prosperous London: The Mayor must work hard to promote London to the world and protect light touch regulation of its financial sector. There needs to be more investment in skills. A democratic London: The Boroughs will come together regularly to meet the Mayor within an advisory senate. Fairness for London: Fight for London to get a better share of Britain's resources; partly by highlighting London's very real social problems. Download a pdf of Warwick Lightfoot's full manifesto. Click here to visit Warwick's website. Editor's comment: "Warwick may not win the primary election process - the hustings for which begin on Monday - but this manifesto contains many useful ideas for improving London. His is a thoughtful and comprehensive manifesto. 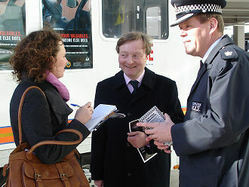 Warwick emerges from this process with his reputation enhanced and as a serious figure within the London Conservative Party. His idea for a zero budget may scare some interest groups but it is a recognition that there is little strategic wisdom within Ken Livingstone's topsy-turvy budgetary process. Much more also needs to be made of his campaign for London to get a fairer deal from the national taxpayer. Many Londoners are very poor and London is a very expensive city. London's subsidy for the rest of the UK is too great. Our capital city needs a Mayor who will campaign for a fairer revenue sharing settlement." My ballot paper arrived yesterday. I am not going to send it in until the last minute (i.e. after the hustings). I urge others to do likewise. I suspect that, in the end, Lightfoot will fall beneath the Johnson juggernaut, but reading this as a Londoner, it is clear to me that he has given this a great deal of thought and has put together some ideas that will benefit all of London (and not just Livingstone-central). "Boris - take note. This man might be the best person to advise you on policy..."
I absolutely agree. After the selection Boris should make him his deputy and/or Chief of Strategy. And Boris will need to perform very well at next week's hustings to ensure that his ideas do not look lightweight against Lightfoot. Boris should also state explicitly at the hustings that he wants all 3 of the other Tory finalists to have major parts on his campaign - to become key members of Team Boris. Interesting that Justin H's steadfast support of Andrew Boff seems to be weakening...but I agree we should not send back our ballots until we have heard the hustings (or, if you cannot get there, ConHome's account of them, natch). Warwick is absolutely brilliant. I fully endorse the comments above - for what that's worth.